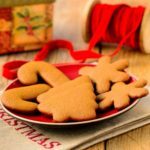 These Ginger Molasses Cutout Cookies are thin, crunchy, and a wonderful treat reminiscent of gingerbread cookies. Make them for homemade holiday gifts. Cream butter and brown sugar in a large bowl until light and fluffy. Add molasses and egg and beat to combine. Whisk together flour, ginger, baking soda, salt, cinnamon, and mace in a medium bowl. Add to creamed mixture and beat until just combined. Add water and vinegar and mix to combine. Place plastic wrap on directly on top of the dough in the bowl and chill overnight. Pre-heat oven to 350°F. Line cookie sheets with non-stick liner or parchment paper. Divide dough in half. Roll one half of the dough to 1/4-inch thickness or a lightly floured work surface. Keep the other half of the dough chilled until rolling. Note the dough with be soft and somewhat sticky. Move it around on the work surface and sprinkle with flour while rolling to keep it from sticking. Chill dough if it becomes too warm or work in smaller batches. Cut dough with cookie cutters and place cutouts 2-inches apart on cookie sheets. Place baking sheet in refrigerator until ready to go in the oven. You can gather up dough after cutting for more cookies. Chill thoroughly before re-rolling. Bake until the edges have slightly browned, about 14 minutes. Transfer cookies to wire rack to cool completely. Time stated does not include chilling dough overnight. The amount of cookies depends on size and shape of cookie cutters used.